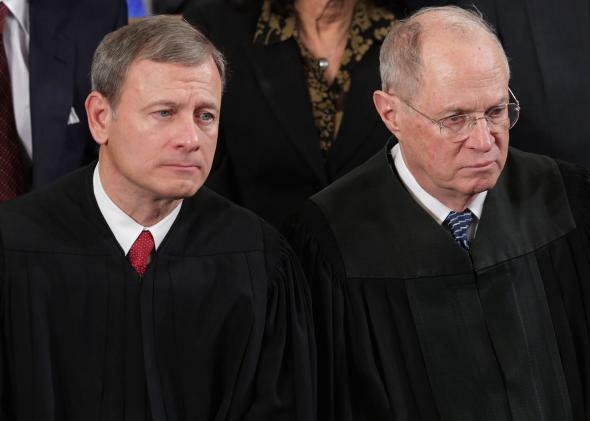 Obamacare at the Supreme Court: The most important moment was Justice Kennedy's. The most telling line of questioning at Wednesday’s oral arguments did not come from U.S. Supreme Court Chief Justice John Roberts, left, but from Justice Anthony Kennedy. This line of questioning can certainly be read several ways, but it suggests that Kennedy’s mind is not completely made up, and that he is worried about the states’ rights issues raised in the amicus briefs supporting the Obama administration. Moreover, it also hinted that Kennedy would be willing to look past the plain meaning of the “four simple words” in the statute —“established by the State”—and assess both the larger context of what the law intended to do, and what unforeseen results it might have for the states. It’s hard to overstate how very grimly Justice Kennedy viewed the whole Obamacare project the last time the court looked at the statute, in 2012. And to be sure, he asked tough questions of Solicitor General Donald Verrilli this morning. But to the extent that anyone believed that Chief Justice John Roberts was the only one to watch in this appeal, this morning Kennedy gave them someone else to talk about: Kennedy.